You don’t need to venture across the Bay Bridge to party by the water this summer. Baltimore’s Canton neighborhood was already getting ready to welcome the Merritt Clubs’ new rooftop pool this Memorial Day weekend. The club’s Boston Street gym will feature two pools, a restaurant and bar – part of a $20 million addition and parking garage. It’s been under works for more than a year. 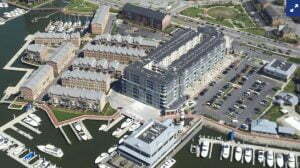 And now Scott Plank‘s War Horse Cities LLC, which acquired a swath of the nearby waterfront for more than $22.5 million, is promoting the opening of “an urban resort” that promises “luxe private cabanas” and a “carefully curated menu,” all against the backdrop of the “glittering waterfront.” Yes, we’re talking about the formerly industrial waterfront, not Miami. The existing pool, a now-shuttered restaurant space, a marina and a helipad are among the assets Plank bought in October as part of the Lighthouse Point and Baltimore Marine Centers portfolio sold by Dr. Selvin Passen. Scott Plank purchased the marina and other properties in Canton for $22.5 million in October 2017. The pool and restaurant are the first to undergo a transformation as Plank develops an overarching vision for the property aimed at drawing in visitors arriving both by land and by water. War Horse Cities spent $500,000 on the renovation of the former Baltimore Marine Center Pool, which will now be known as Swim Club at Lighthouse Point. Improvements include a revamped bath house, safety upgrades, high-speed Wi-Fi and an enhanced reservation system, as well as cleaning and maintenance updates. The pool will also feature a two-station bar with a menu of burgers, hot dogs, salads and other offerings, as well as a cocktail menu. On-site cabanas will be rentable for the day. A fenced-in dog park adjacent to the pool is also on the way, on a grassy strip of land north of the clubhouse. Swim Club will be reserved for members from 10 a.m. to 7 p.m. each day, and then will open to the public for cocktails and music in the evenings. Memberships to the pool cost $950 for individuals, $1,400 for couples and $1,850 for families of two adults and up to three children under the age of 18, with a $500 initiation fee. After 7 p.m., entry to the pool will be free. A new restaurant next door, in the former Canners Row space, will follow soon after the pool’s relaunch. The eatery, which does not yet have a name, is slated to open in early July. Canners Row was evicted in April after War Horse Cities said the bar and restaurant hadn’t paid rent for several months. Both the pool and restaurant are currently hiring staff. War Horse has brought on former Dean & Deluca Managing Director Jay Coldrento oversee the development of both concepts, as well as run the developer’s new hospitality department. Swim Club, he said, is just the beginning. Coldren and Plank said they hope Lighthouse Point will become a destination for boaters traveling up and down the East Coast, as well as for nearby residents. Coldren said War Horse Cities is talking with the water taxi system – purchased in 2016 by Sagamore Ventures, an investment company owned by Scott Plank‘s brother Kevin – to see if the development can be added as a stop. As one way to draw in residents and new visitors, the pool will host a free “Summer Sounds” concert series on Sunday nights in its parking lot. The idea is a transplant from Belvedere Square, also owned by War Horse Cities, which has hosted “Summer Sounds” concerts for more than a decade. Plank said he also plans to bring the concert series to Hollins Market, which War Horse is working to redevelop. The Swim Club at Lighthouse Point and the Merritt rooftop pool and restaurant add to Baltimore’s already bustling waterfront pool scene. The Sagamore Pendry has an infinity pool that offers membership to non-hotel guests for a few thousand dollars a summer, while the Four Seasons Baltimore reserves its infinity pool for hotel and spa guests, as well as those who buy a day pass for $175. See the full article on the Baltimore Business Journal website here.